Barbers' bowls have a recess in the rim designed to fit the neck during shaving and a depression in the rim to hold the soap. They seem to have been developed in the 17th century. Barbers also combined their trade with that of a surgeon - hence the Barber Surgeons' Company of London. Their bowls could also be used for bleeding, which was widely used as a remedy for many illnesses. Blood was usually taken from a vein in the arm, which fitted into the recess in the rim of the bowl. 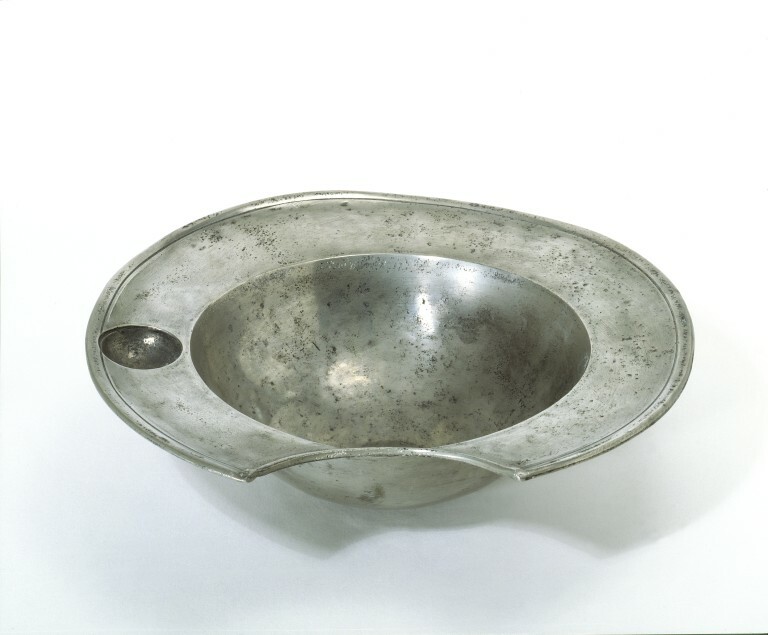 This bowl is typical of the plain, cheap, practical domestic wares made by English pewterers in the 17th and 18th centuries. Like most pewter vessels, it would have been cast in a mould. 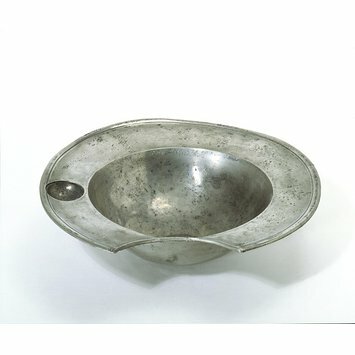 Bowls and dishes were usually beaten with a hammer to compress the metal and give it extra strength. On the base are the initials, or 'touch-mark', of the maker. On becoming a master every pewterer was required to register his mark at Pewterers' Hall. Marks were sometimes taken over by the maker's descendants and country pewterers often copied London marks.